Department 4298, 1000 E. University Ave.
CAC created coloring books that carry the theme of disability awareness for children. The stories feature a boy named Sam and his various friends as he learns about the differences and similarities between himself and his friends with disabilities. Currently, the series is composed of five books, most available in both English and Spanish. If you are interested in receiving copies of these coloring books please contact windcac@uwyo.edu or use our Coloring Book Order Form (PDF). Instate: For instate orders, coloring books are available for no cost and we can mail to you. Out of state: For out of state orders, we provide 50 copies free of charge but there is a charge for shipping. There is an additional cost for over 50 copies of the books of $.50/book. 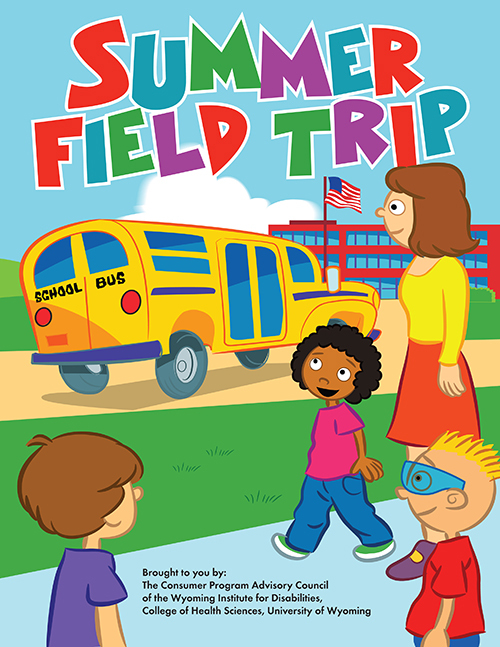 Summer Field Trip teaches us all about seizures with Fred and his friend Cathy, who has epilepsy. On a trip to the mall, Cathy as a seizure after playing arcade games. Fred and their classmates learn what a seizure is and what to do if someone has a seizure. Download in English and Spanish. Play Ball! introduces us to Jack and Sam. Jack uses a wheelchair because he can't walk. As the boys get to know each other, they find they share many common interests, including playing baseball. Sam introduces Jack to more of his friends, and they PLAY BALL! Download in English or Spanish. In Ready, Set, Go!, Sam introduces us to Sally, a new girl in class who has a learning disability. Sally explains her dyslexia as mixing up letters and numbers, which causes her problems with reading and math. She works with a classroom aide, Mr. Gonzales. The book closes with Sam, Jack and Sally going swimming. Download in English or Spanish. 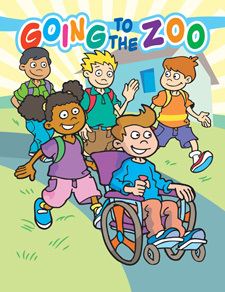 Going to the Zoo introduces Ben who has a hearing impairment, and Joe, his brother who sometimes acts as his interpreter. The class is going to the zoo, and George and Sally are curious about Ben and Joe's use of sign language. The boys explain that they use sign language to talk, and explain what it is. They also teach their friends some sign language. Download in English or Spanish. Let's Ride introduces us to Fred, and some of the effects that traumatic brain injury can have. 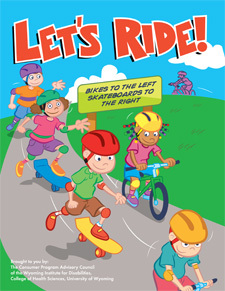 This book emphasizes the importance of wearing helmets and appropriate bicycle safety. It also describes some of the strategies that can be used to address the effects that a traumatic brain injury can have after the outward injuries have healed. Download in English or Spanish.